Nicely centered sunspot April 13, 2019 - SolarChat! The Sun and weather cooperated today, on a weekend no less. The seeing produced softer images today but the subject matter was great. This sunspot has been a real treat to follow since rounding the limb on the 7th. Todays images are from a DS PST and a Quantum Six telescope. 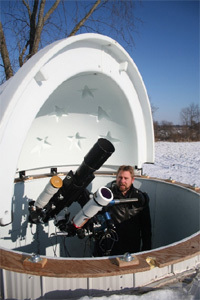 A 2x telescentric, SolarSpectrum etalon, and PGR Grasshopper was attached to the Quantum scope. No reducer. With all the fine images posted today, we all know what the Sun looked like. Here's my take anyway. Thanks for looking. A very nice pair of images indeed Phil. Glad the sun was obliging for you this weekend. Beautiful close view with that Solar Spectrum filter, Phil. Nicely resolved penumbra and light bridge details. This is a mosaic of 4 images showing a more complete view of AR12738 on April 13th. Some wonderful detail in those shots!